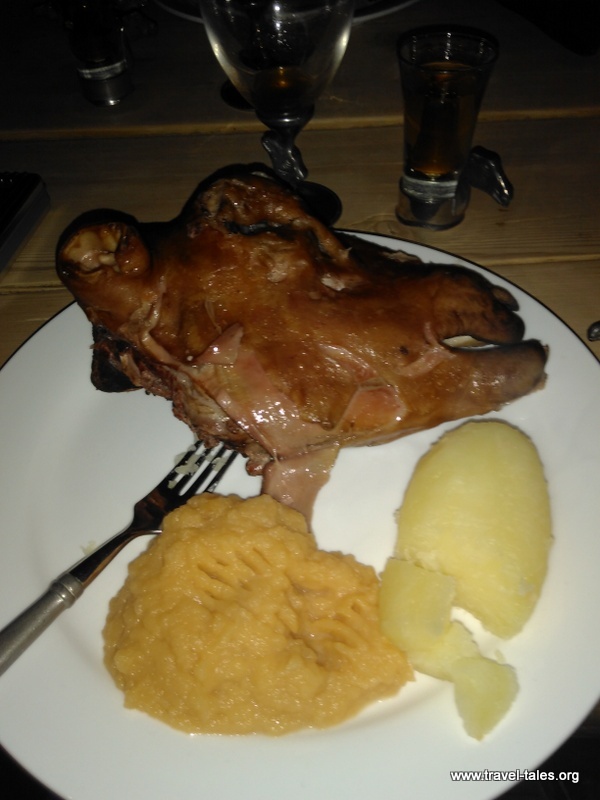 In the spirit of nothing being wasted when slaughtering a sheep, smoked sheep’s head is a Norwegian delicacy, Smalahove. Of course I couldn’t refuse to join in this experience (although now that I’ve done it once, I’m not sure I’ll do it again…). The venue and its fittings out are all devoted to sheep heads. We enjoyed local beer and a shot or so of a local spirit while we were waiting, not least to to steel our nerves before the server arrived with a tray of steaming smoked sheep heads. It was served with potatoes and mashed swede, resulting in lots of discussion of what swede is. I duly learned what rutabaga is, the word used in France for this root vegetable. Scots will be saddened to see their neeps & tatties were served separately. Each serving is actually only half a head, so only one cheek and eye and ear. There is a fair amount of meet in the cheek. The heads are smoked before they are cooked and the flavour of the meat reminded me of smoked bacon. After eating as much of the head you wish to, there are a couple of bones of interest. The jaw bone is just rather curious and reminded me of a natural history museum. The smaller one, shown here on my plate is important at one of these dinners. The person who finds the longest of these wins a prize. Mine was shorter than that of my neighbour, so I left it to sit on my plate. I chose not to eat the eye, although at least one of the group did. Apologies to vegetarian readers, here’s a more wholesome picture of a Voss sheep. You must warn me when you travel to Norway! sorry! Most things were organised by the competition. My trip home was stunning (you’ll see more here) but quite time constrained so I didn’t think of making contact with anyone.